The front of the courthouse where the Ninth Circuit Court of Appeals meets. Not many people have heard of a court case that goes by the name Al-Haramain Islamic Foundation v. George W. Bush. But it's currently at the center of a far-reaching legal struggle over terrorism, surveillance, and the United States Constitution that's being played out in the courts. On August 15, 2007, the Al-Haramain case made its way to San Francisco, where the Ninth Circuit Court of Appeals heard arguments prior to making a ruling -- a ruling that (no matter which way it goes) will inevitably be appealed to the Supreme Court, where it will be settled once and for all. This page will serve as both a first-person account of what happened on August 15 at the Ninth Circuit Court of Appeals, and as a research archive for anyone interested in the Al-Haramain case. Does the United States Government have the right to conduct secret surveillance of terrorism suspects on American soil? A Saudi charity known to finance terrorist activities opened a branch in Oregon. The U.S. government tapped the phones of the Oregon branch and heard evidence that they were helping to finance terrorist activities as well -- specifically, that Al-Haramain had illegally funnelled cash from the U.S. to terrorists in Chechnya. With this info in hand, the government designated the Oregon branch as terrorists, and froze their assets. The Oregon branch, unaware that they had been sureveilled and that the government had solid evidence against them, challenged this, and during legal proceedings, a government employee accidentally gave logs of the tapped phone conversations to the charity's lawyers. At that point, the case changed gears: the charity hooked up with liberal lawyers to challenge the very legality of the surveillance, and by extension the legality of all secret surveillance. The decision was made to make the trial into a test case designed to weaken and embarrass the Bush administration. The government sought to circumvent this strategy by suppressing the evidence of the leaked document on grounds that its exposure would endanger national security. The governement requested back and eventually obtained all U.S. copies of the surveillance logs -- but not before an unknown number of copies made their way overseas, presumably into hostile hands. Aside from revealing the fact that the charity was surveilled, it is not clear what "operational details" the leaked document reveals. The government refuses to admit to the wiretapping or to say whether or not a warrant was obtained. The entire case, as it is now being litigated, hinges on the question: do the plaintiffs even have the legal right to sue the government? In order to prove they have "standing," they must prove they were surveilled; and so must refer to the only evidence which proves this, the mysterious document. The government claims the document is Top Secret, and thus not admissable evidence. It is this question that was being argued before the Ninth Circuit Court on August 15. That's where things stand at the time of this writing. And even if you knew nothing more about the specifics of the case, deciding which side you favor is almost necessarily dependent on your political philosophy. Even granting the allegation that the surveillance was done without a warrant, there are many who argue that the government would be abdicating its duty to protect its citizens if it did not monitor known terror suspects, warrant or no warrant. But does the "slippery slope" argument apply here: if we allow warrantless surveillance of terror suspects, are we to assume that the government will eventually abuse this power to harrass non-terrorists for politcal reasons (which is obviously what many on the left fear)? Still can't decide? Read on. Al-Haramain case is being heard. Al-Haramain Islamic Foundation, Inc. was the Ashland, Oregon-based American branch of Al-Haramain Islamic Foundation, a huge international Islamic charity founded and headquartered in Saudi Arabia, with subsidiaries in countries around the world. After 9/11, several governments (including the U.S., the U.K., and even the United Nations) began investigating the terror funding network, and found evidence that money from Al-Haramain was used not just for charity projects but also to finance Al Qaeda and specific terrorist plots. Various foreign branches of Al-Haramain were broken up or shut down, but it was not apparently until 2004 that the U.S. branch of Al-Haramain came under intense investigation. In early 2004, government intelligence services supposedly (or has been alleged) began electronic surveillance of phone calls connected to the Ashland Al-Haramain office. It is not known if warrants were obtained, or if the calls were domestic or international. Partly based on intelligence gathered during this surveillance, The U.S. government declared the Oregon branch of Al-Haramain a "specially designated global terrorist." In particular, the government learned that the directors of Al-Haramain had withdrawn $150,000 from their U.S. bank account, converted it into traveler's checks, and then smuggled it out of the country to terror groups in Chechnya -- without filling out the proper tax forms regarding financial transactions, which is a criminal offense. Unexpectedly, Al-Haramain fought back. They contacted lawyers and sued to have the "terrorist" designation revoked. During what is called "discovery" (a legal term in which each side in a civil case must reveal its evidence to the other side), an employee of the U.S. government accidentally included in a stack of documents given to Al-Haramain a Top Secret record of the surveillance logs. Al-Haramain's lawyers brought in more anti-government lawyers, who recognized a golden opportunity: since this Top Secret document proved that surveillance of specific individuals had taken place, they now had "standing" (the legal right) to challenge the entire underlying lawfulness of government surveillance in principle. And so the case went into overdrive, and suddenly took on much greater significance than just an individual organization fighting for its reputation: legal activists saw a chance to use the courts to stop the Bush administration from surveilling anybody. If they could get the courts to rule that Al-Haramain had been surveilled illegally, then it would set a precedent and prevent any similar surveillance in the future, and also would render unusable any evidence gathered by surveillance in the past. In other words: a very big deal. The government's legal team sought to forestall this by recalling the document, insisting that its Top Secret status made it unusable in court because revealing its contents would endanger national security. From here onward, things became bizarre, a dizzying tug-of-war over surrealistic legal technicalities. Both sides were put into completely impossible positions: The government had to suppress a document which revealed Top Secret surveillance without actually admitting that it had conducted any surveillance; whereas Al-Haramain sought to revoke its designation as a terrorist organization by citing the very evidence (the information gathered during the surveillance) that suggested it was a terrorist organization. The government requested that the case be thrown out of court on technical grounds, since the only way Al-Haramain could even prove it had the standing to challenge the surveillance was to cite the mysterious document -- which the government claimed was not admissible as evidence. Al-Haramain countered that it could rely on people's memories and descriptions of the document. An Oregon district judge ruled in Al-Haramain's favor: the case could go forward. The government appealed the judge's decision to the Ninth District Court of Appeals (which brings us back up to August 15, 2007). Whichever way the appellate judges rule, one side or the other will then appeal it to the Supreme Court. What does Al-Haramain want? Well, according to the original complaint filed on February 28, 2006, they are seeking acknowledgement that the government conducted warrantless phone surveillance on Al-Haramain's director Soliman al-Buthe (who subsequently fled to Saudi Arabia) and Al-Haramain's lawyers Asim Ghafoor and Wendell Belew -- surveillance which violated a 1978 federal law called FISA (the Foreign Intelligence Surveillance Act), and a treaty called the "International Covenant on Civil and Political Rights," and their constitutional First, Fourth and Sixth Amendment rights. They also are seeking suppression of any evidence gathered by the surveillance; revocation of their status as a "specially designated global terrorist"; and punitive damages totalling $1 million plus a thousand dollars a day and attorney's fees. Whew! With me so far? But enough about the technicalities of the case for now. Just whom are we talking about, here? What is the Al-Haramain Islamic Foundation? Al-Haramain Islamic Foundation -- based in Riyadh, Saudi Arabia, and with branches around the world -- purports to be an innocuous charity which collects funds to help Muslims in poor countries. But this façade is a cover for its real purpose: to spread extremist Wahhabi doctrine internationally, to provide funding for Al Qaeda, and to finance specific terror plots. was allowed inside the courtroom. The United Nations, The United States, Great Britain as well as several other countries have all designated Al-Haramain as a terrorist entity; frozen and seized its funds where possible; and banned it from conducting business. Even so, Al-Haramain continues to operate in third-world countries and almost certainly continues to fund and promote radical Islamic extremism to this day. The following links document some of the terrorist financing and extremist activities carried out by Al-Haramain, as well as the sanctions imposed against it. • CBS News reported in 2004 that the 1998 embassy bombings in Tanzania and Kenya (which killed 223 people and injured over 4,000) were financed with Al-Haramain funds; and that it was well-known to Western governments that funds donated to Al-Haramain sometimes found their way to Al Qaeda, and had been used to finance several terror plots. • In January of 2004, the Washington Post also published an article describing declassified U.S. intelligence documents which showed that employees of Al-Haramain carried out the Tanzanian and Kenyan embassy bombings, that Al-Haramain funded Indonesian terrorists, and that terrorists associated with Al-Haramain plotted to assassinate Americans. • According to the Australian newspaper The Age, Al-Haramain funded the Bali bombers in 2002 -- one of the most devastating post-9/11 terror attacks, in which 202 people were killed. • The Albanian branch of Al-Haramain funded jihad and had a connection to Osama bin Laden himself. • The United Nations itself maintains a list of organizations that provide support for Al Qaeda, and the various international branches of Al-Haramain are featured prominently on the list. Al-Haramain is now banned globally by the U.N.
• On May 6, 2004, The U.S. Treasury Department desginated the Bosnian branch of Al-Haramain as a terrorist entity. • On September 9, 2004, the U.S. Treasury Department announced that it "had found direct links between the U.S. branch of Al Haramain, headquartered in Oregon, and al Qaeda leader Osama Bin Laden." • Official Treasury Department press release announcing the designation of Al-Haramain in Oregon as a terrorist entity. • February 19, 2004 Treasury Department press release about actions taken against Al-Haramain Oregon. • The Bank of England -- the official financial arm of the British government -- issued this statement in 2004 saying that they were freezing the funds of the Oregon branch of Al-Haramain as part of its crackdown on Al Qaeda, and pursuant to the U.N.'s designation of Al-Haramain as a terrorist entity. • The Western Resistance blog featured this 2006 posting which described Al-Haramain Oregon's project of distributing extremist jihad literature in US prisons, and also listing some of the evidence against them. • Almost incredibly, at the exact time that I was in the courtroom observing the argumentas in the Al-Haramain case, the founder of Al-Haramain Oregon, Pirouz Sedaghaty (a.k.a. Pete Seda) -- who had fled overseas -- was caught by law enforcement as he tried to re-enter the country via the Portland airport on August 15. • According to a 2004 AP article, Pete Seda "appeared in the Fourth of July Parade with his pet camel" and "taught [Ashland, Oregon] schoolchildren about Islam." • Daveed Gartenstein-Ross's insider account of working at Al-Haramain, and how radical it was, at (of all places) Reader's Digest. • This CNN profile of Daveed Gartenstein-Ross and his experience at Al-Haramain is part of their series called "God's Warriors" by Christiane Amanpour. • At the Weekly Standard, Daveed Gartenstein-Ross gives a concise history of Al-Haramain and its terror connections. • In 2003, the U.S. Senate Judiciary Committee heard testimony that Al-Haramain was the main mechanism for Saudi Arabia to spread Wahhabi doctrine across the world. • The Militant Islam Monitor site has pages documenting some of Al-Haramain's links to extremism and terrorist activities. • The terror group "Al Qaeda in Iraq" as well as Osama bin Laden himself both refer to the nation of Saudi Arabia as "Al-Haramain Country." • In 2003, FrontPage ran one of the first exposés of Al-Haramain, asking why the Ashland, Oregon branch was still in business, and including background info on Al-Haramain's overseas offices being connected to terrorism. • The New York Times ran a sympathetic article about an Algerian Al-Haramain member who ran the Tanzanian branch and who was expelled from the country and accused of terror connections. • The Saudi director of Al-Haramain also sued the US government over his terrorist designation -- part of what some call the "legal jihad." • In 2004, The National Review ran an article showing that the Saudi government had not actually shut down Al-Haramain at all, despite its claims to have done so -- and that Al-Haramain was still active worldwide. • Saudi Arabia's claims of closing Al-Haramain were overstated, according to the Counterterrorism blog. Despite all the evidence provided here, Al-Haramain's American attorneys continue to insist that their clients have absolutely no connection to terrorism. And they seem to have only taken on the case because they saw it as a way to challenge the Bush administration's wiretapping program. But to an outside observer like myself, it looks like they have chosen the worst possible test case, because Al-Haramain appears to be a worthy subject of surveillance, whether or not a warrant was obtained. Even if Al-Haramain's attorneys have a strong legal argument and are successful in their case, it will leave the impression that they have just handed a victory to Al Qaeda. For reasons of convenience, the Ninth Circuit Court of Appeals arranged to have the Al-Haramain case argued on the same day and during the same session as a similar case that is much more well-known: Hepting v. AT&T. So that most of the media's (and the blogs') coverage of the Al-Haramain case is relegated to being an afterthought at the end of much more extensive coverage of the Hepting case. Several individuals (led by the aforementioned Mr. Hepting) have sued AT&T, accusing the telecommunications company of cooperating with the National Security Agency in conducting mass warrantless surveillance on electronic communications signals. The Hepting plaintiffs claim to have evidence that there is a "secret room" in the San Francisco AT&T communications center where a duplicate of the main electronic traffic cable is routed, and which only NSA members have access to. Because there is no evidence of surveillance of any particular individual, this is more of a class action case, asking the courts to stop blanket surveillance of communications (emails, to be specific). It seems to my non-expert mind that the issues involved in the Hepting case are completely separate from those of the Al-Haramain case, so I won't go into them any further. I'm only mentioning the AT&T case here to explain some of the references and photos below. Now that everyone's familiar with the facts of the case, let's finally turn our attention to what happened at the Ninth Circuit Court of Appeals on August 15, 2007. Unfortunately, as the caption to the previous photo states, no photography or other recording equipment was allowed in the courtroom. So I don't have photos or videos that I took myself. C-SPAN videos for Al-Haramain and Hepting August 15 arguments. The top link is the Al-Haramain half of the hearing; the second link is the Hepting half. You can also view this same video directly on its YouTube page, or (at least for now) directly on KGO's own site (which has better resolution). Wired live-blogging of the August 15 hearing. DailyKos live-blogging of the August 15 hearing. Both the Wired and DailyKos reports strongly side with the anti-surveillance point of view, and refer to Al-Haramain blandly as a "charity," with absolutely no mention of their terror connections. 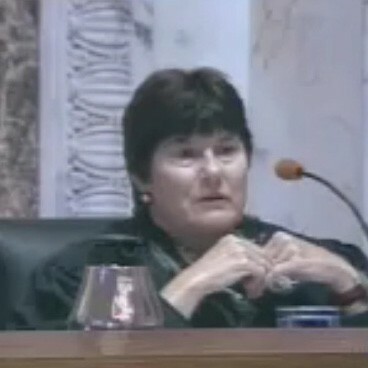 Also, KTVU ( a local TV station) ran this article describing what happened at the August 15 hearing which gives a concise summary of the day's action. As the three links above reveal, the gist of the argument was this: The attorney for Al-Haramain claimed to have seen evidence that they were surveilled by the government (the mysterious document given to them accidentally during the "discovery" phase of the trial). Even though the document was recalled, and is not admissable as evidence, and even though they have no other evidence that the surveillance was warrantless, Al-Haramain wanted to press forward with the case based on the memories and descriptions of the document, provided by the various people that saw it before it was given back to the government. To counter this, the attorneys for the government claimed that the document and its contents are literally Top Secret, and as such cannot even be discussed in court -- even as memories. Furthermore, the witnesses' memories could only be debunked by referring to the document itself, which the government cannot do -- Top Secret that it is. Thus, lacking any evidence whatsoever that they was surveilled at all (or at least any evidence that can be introduced or even discussed in court), much less any evidence that the putative surveillance was warrantless, Al-Haramain's suit should be not allowed to proceed at all. For their part, the judges expressed frustration at the overarching security concerns, and also expressed resentment that the court system had little or role to play in determining what counted as Top Secret. A sketch artist was on hand to draw this image of one of the attorneys arguing before the judges. I snapped this photo of her sketch as she left the courtroom. She continued to touch up her drawing outside after the hearing. Here are the three Ninth Circuit Court of Appeals judges who heard the case: Michael Daly Hawkins, Harry Pregerson, and M. Margaret McKeown. The three judges as they question one of the United States government attorneys. Hawkins, on the left side, is a Clinton appointee and known to be fairly liberal. McKeown, on the right side, is also a Clinton appointee, and also somewhat liberal (though perhaps the least of the three). Which leaves us with Harry Pregerson, the man in the middle. According to most sources, Pregerson (a Carter appointee) is the most liberal of all appellate judges. During oral orguments on August 15, Judge Pregerson showed his colors as he verbally mocked the government's lawyers when they said that the judges should give "utmost deference" to the government's designation of what constitutes matters of national security. 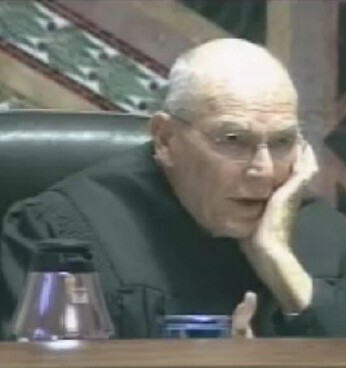 Pregerson's snide remark upon hearing the phrase was, "What does 'utmost deference' mean? We just bow to it? ", which elicited laughter from the courtroom audience. And yet the government attorneys were merely quoting verbatim this ruling (pdf file) from September 2006 by United States District Judge Garr King who was citing earlier legal precedent when he himself said that the judges are expected to give "utmost deference" to the government's opinion as to what merits "Top Secret" security classification. In fact, throughout the day, all the judges frequently made sarcastic comments to the government lawyers, while being light-hearted and sympathetic to the attorneys for the plaintiffs (Hepting and Al-Haramain). I haven't observed many trials in my life, but I found the judges' behavior quite surprising. I'd be shocked if they didn't rule for the plaintiffs in both cases. Interesting side note: At one point Judge McKeown asked one of the attorneys in the Al-Haramain case if perhaps "hostile intelligence" agents -- in other words, members of Al Qaeda -- were at that very moment sitting in the courtroom itself observing the proceedings. Which is exactly what I had been thinking. As soon as she said it, people in the audience shifted uncomfortably in their seats and gave each other sidelong glances. Who knows? She may have been right. This is Jon Eisenberg, the lawyer representing Al-Haramain during the August 15 hearing. He is most famous for being the lead attorney in the Terri Schiavo case, representing Schiavo's husband in his ultimately successful quest to have her killed. The title of the book that Eisenberg wrote about the case, The Right vs. The Right to Die, clearly indicates his political leanings. Jon Eisenberg is also doing his best to win the fight outside the courtroom, with a full-court press in the court of public opinion. He wrote this op-ed for a law newsletter, overtly expressing his anti-Bush feelings. Eisenberg's op-ed was considered sufficiently radical to be re-published on the left-wing Truthout site. The Los Angeles Times helped Eisenberg in his media blitz, running this puff piece profile of him as part of his PR campaign with the sympathetic press. 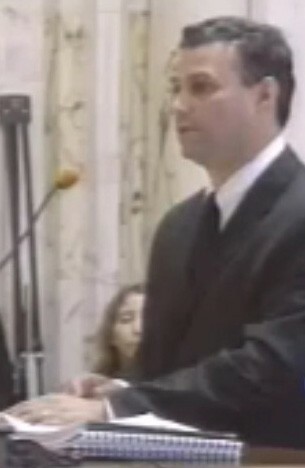 Facing off against him was Thomas Bondy (seen here in a freezeframe from the C-SPAN video as he argued the case against Al-Haramain), who represented President Bush (who was personally named as a defendant) and the United States government. And it looked like Bondy really had his work cut out for him. Not only were the judges on the same side ideologically as his opponent, but the media -- as we will see in the following images -- were favorable to his opponent as well. Findlaw has a complete listing of all official legal documents about the case -- essential reading for anyone interested in the legal aspect of the proceedings. PDF file of the government's indictment against Al-Haramain in in Oregon. The original official legal complaint filed by Al-Haramain against George W. Bush can be read in its entirety in this huge 144-page pdf file (it is recommended that you right-click or control-click to download the file rather than try to read it within your browser). This hour-long 2006 podcast from Lewis & Clark Law School in Oregon is essential listening for anyone interested in the motivation of the lawyers representing Al-Haramain: Steven Goldberg, Al-Haramain's original attorney, gives long and detailed explanation about the beginnings of the case, with insights into his way of thinking and political attitudes. Needless to say, he completely glosses over any Al Qaeda connections his clients might have had -- as if that was either completely irrelevant or obviously untrue -- and instead focuses exclusively on targetting the government. This pdf file of a legal newsletter article gives a good summary of the September 2006 court decision in Oregon to let the case go forward. This 2006 Portland Indymedia report has the press release about the Oregon district judge's decision to let the case proceed. The Portland office of the National Lawyers Guild has a comprehensive overview of the case from Al-Haramain's point of view, summarizing the legal difficulties of the arguments. The "social justice" blog eteraz.org had a nicely concise summary of the case against Bush in the introduction to this posting about the August 15 hearing. On the Crossroads Arabia blog, Wendell Belew -- one of the lawyers for Al-Haramain who claims he was surveilled, and the person who brought this case against the US Government -- has left several comments on various posts, explaining his views on the story. Al-Haramain's director Soliman Al-Buthe has also left comments on Crossroads Arabia, including one on this post about Saudi Arabia joining in the U.S. designation of most overseas Al-Haramain branches as terrorist entities. After both the Hepting and Al-Haramain cases had been heard by the judges, the court session was gaveled to a close and everyone had to file out of the building. Because cameras had been banned from the proceedings, the media were waiting outside en masse, hungry to get footage and interviews. Interviews with the proper people, that is. ...and then completely ignored him once they realized who he was. They had no interest in hearing what AT&T might have to say. But when his opponent, Robert Fram, an attorney for the Electronic Frontier Foundation (a nonprofit on the "Hepting" side of the case) came out, the media descended on him in a frenzy. The media fought over the right to ask him questions. He spoke at length. When the main phalanx of lawyers representing AT&T emerged . . . they were completely ignored by the media, and walked away without giving a single interview. Then Jon Eisenberg, the main attorney for Al-Haramain who had just argued the case, emerged from the building and let out a greeting of camaraderie and relief when he spotted his buddies in the media. Needless to say, they surrounded him and eagerly let him tell his side of the story. Jon Eisenberg pontificated for quite a long time. I recorded this video of Jon Eisenberg saying his bit, and answering questions. (Also available directly on YouTube here.) Unfortunately, there was a great deal of background traffic noise and a strong wind, so the audio portion is a bit difficult to hear at times. Finally, Thomas Bondy -- the attorney for President Bush who was arguing the government's case against Eisenberg -- came out the courtroom door. He and his team of lawyers walked right past the reporters who had just interviewed John Eisenberg (including one who was still interviewing him, on the left of this picture). But not a single reporter showed the slightest interest in questioning him or interviewing him. When Bondy got to the bottom of the stairs, he heard something behind him and turned around, perhaps thinking it was a reporter asking him a question -- but no, it was just one of his colleagues. They stood there all by themselves, with at least 15 media members nearby, and no one approached them. So, they decided they might as well just leave. I don't know if they even wanted to give interviews -- perhaps they were glad they didn't have to repeat "no comment" over and over. But either way, no one in the media even tried. Why was Eisenberg treated like a superstar, while Bondy was totally ignored by the media? Bondy and the team of government lawyers walked away into the distance. After this report was originally published (in August of 2007), several legal decisions and maneuvers have happened in relation to the Al-Haramain case. Because there is still a great deal of public confusion about which side was victorious, in this update I will try to disentangle the various rulings, decisions and votes. I have outlined the three most significant outcomes below (though this update is not necessarily comprehensive, and there may very well be other aspects of the Al-Haramain aftermath that are not discussed here). The Ninth Circuit Court eventually handed down its Al-Haramain ruling on November 16, 2007, and infamously, the San Francisco Chronicle ran two articles simultaneously on its Web site each giving completely opposite interpretations of what occurred. This screenshot (click on it to see a full-size version) taken on November 16, 2007 shows both articles open side-by-side in separate windows, at the same time. The article on the left, written by Chronicle staffer Henry K. Lee, sports the headline "Islamic Charity Wins Right to Sue U.S. Over Wiretapping," and goes on to say in essence that Al-Haramain was victorious in that the court allowed its lawsuit to move forward. However, at the exact same time, also on the Chronicle Web site, was an article by AP writer Paul Elias with the headline, "Court Deals Blow to Wiretapping Case," with an accompanying article that said Al-Haramain's suit had been dealt a "near fatal blow" by the court's ruling. Both articles are still online, though with slightly altered headlines: you can find the Henry K. Lee article here at SFGate, and the AP article here at the International Herald Tribune. So -- which article was more accurate? It depends on your point of view, though it seems to me that the Bush administration pretty much got what it wanted, which is surprising considering that the cards seemed stacked against them inside and outside the courtroom on the day I visited. Basically, the Ninth Circuit Court of Appeals ruled that the lawsuit by Al-Haramain would be allowed to continue (which their lawyers optimistically construed as a victory), but that they would not be allowed to refer to the leaked surveillance records in the lawsuit, nor could they describe them from memory -- which is exactly what the Bush administration lawyers had requested. So Al-Haramain was allowed to proceed with their suit, but were denied use of their only significant piece of evidence, thereby dooming the case to almost certain defeat. The decision handed down by the Ninth Circuit did not resolve the case -- it merely handed it back down to another judge who was to make a follow-up decision on the viability of the lawsuit, incorporating the new fact that the secret surveillance records were not admissable evidence. Chief U.S. District Judge Vaughn Walker issued his ruling on July 2, 2008, and once again there were conflicting media reports about what the ruling meant, and who won. 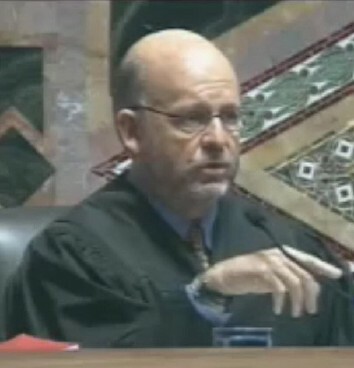 The Associated Press ("Judge tosses wiretapping lawsuit by Islamic group") and UPI ("Federal judge tosses wiretap suit") both ran articles stating that Judge Walker had dismissed Al-Haramain's case completely, since the surveillance evidence was inadmissable, thereby handing a conclusive victory to the Bush administration. Many other news sites chimed in with similar assessments, with the added proviso that Al-Haramain's lawyers could re-file the lawsuit if they wanted to, but relying only on (useless) publicly available evidence. However, thoroughly contradicting all those news stories were competing articles released at the same time by the New York Times ("Judge Rejects Bush's View on Wiretaps") and the National Review ("State Secrets? Who Needs 'Em? "), both of which trumpeted Judge Walker's ruling as a major victory for Al-Haramain, since Judge Walker ruled that the government had overstepped its own legal strictures against wiretapping, as outlined in the 1978 Foreign Intelligence Surveillance Act. Once again, confusion reigned. The judge's ruling was freely accessible to anyone in the media, but everyone seemed have a different opinion on what it meant. Who was right? It seems in this instance that both points of view were true: a balanced article in the American Bar Association Journal lays it out pretty even-handedly. Judge Walker ruled specifically that Al-Haramain's lawsuit was baseless and should be tossed; but he also ruled generally that the government must adhere to the 1978 Foreign Intelligence Surveillance Act (FISA), which the government most likely did not follow in this instance. Yet his general ruling, while a victory for the anti-surveillance advocates, didn't help Al-Haramain, since (without the leaked document) they had no actual proof that they were ever the subject of surveillance in the first place. So: Al-Haramain lost, but their lawyers felt the lawsuit was a success nonetheless, since the goal was not really to help Al-Haramain in particular, but rather to hinder government surveillance techniques in general. All of these rulings may have been rendered moot, however, when the Senate, a week later, voted to amend and update the Foreign Intelligence Surveillance Act (FISA), which would make the kind of surveillance conducted in the Al-Haramain case legal after all. The House of Representatives had already passed the same bill, and Bush signed it into law on July 10. Now, two key questions remain: Does the FISA law protect the government from surveillance lawsuits retroactively; and will a new proposed amendment to FISA postpone legal immunity for months or years into the future? While the 2008 FISA law does appear to retroactively shield telecommunications companies (such as AT&T in the "Hepting v. AT&T" case discussed above), it's not clear how it will affect the Al-Haramain case, and whether or not it even matters anyway, since at the time of this writing the Al-Haramain case has been tossed out by the court and is no longer pending. It remains to be seen if Al-Haramain's lawyers will ever re-introduce the case, and should they decide to do so, if the new 2008 FISA will stop the case in its tracks once again. The Volokh Conspiracy has a good post about the intentionally obfuscatory media cooverage of the FISA vote, and what ramifications it does or does not have. • All of these facts may have been overwhelmed and rendered moot by the subsequent passage of the 2008 Foreign Intelligence Surveillance Act, which seems to retroactively protect the government from lawsuits regarding purportedly illegal surveillance. If you have any exclusive information about this case, you can send it to me here.